This article originally appeared in Varmint Hunter Magazine, a publication of the Varmint Hunter's Association (V.H.A.). It is reprinted with permission of the V.H.A., © 2007, All Rights Reserved. During the last few months of the 20th century, we were introduced to some wondrous products from the firearms and ammunition industry. One of these wonders was the Hornady 17 HMR, which set historic sales records when it hit the marketplace. as P.O. Ackley described it. Further, Ill include information from my forty-five years of shooting enjoyment and frustration with the little mighty mite. The idea of a subcaliber actually began during the first half of the 19th century. A Swiss gunsmith by the name of Flobert, who was living in France at the time, designed a small rimfire cartridge using only the priming compound as the propellant. Originally in 6mm caliber, the little case was "wildcatted" to 4mm. 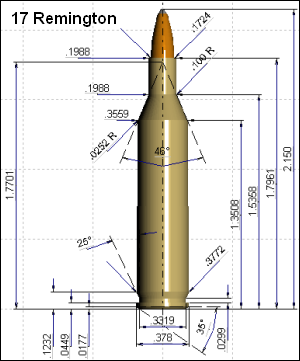 A .172 caliber projectile is 4.32 millimeters. These sometimes elegant little rifles made up for the 4mm rimfire cartridge were known as Schutzens and used primarily for indoor parlor entertainment at ranges up to 10 meters. They also were known to be very accurate for the period. The subcaliber was first noted in the United States during the early 1920s. Alton J. Jones of Portland, Oregon, was known to have necked down the 22 long rifle to 12 caliber, and later a 14 caliber round on the 5.5 Velo Dog case, a small centerfire pistol round used by bicyclists to ward off dog attacks. Jones also made his own 17 caliber cases from large brass wood screws, and was known to have made rifle barrels from truck axles. Quite a talented man, I would say. Around 1943, Charles ONeil of O.K.H. rifle and wildcat fame came up with the idea of a 17 caliber rifle and cartridge, along with making some tooling. But World War II put the project on hold for a few years. At the end of the war the project was revived by the legendary wildcatter P.O. Ackley and some of his cohorts. The first of many 17 caliber wildcats to come down the pike was the 17 Peewee, or 17-30 Carbine as it is sometimes referred to. Ackley made his first 17 caliber bullets from annealed copper wire swaged in an arbor press. The bullets, crude by todays standards, also used a hollow-point tip and were very accurate and deadly on small game. So you want a 17 caliber wildcat? This is what you'll need to start your project. Front: Finish Chambering Reamer by Dan Green, 0.196" outside diameter neck. Back row, left to right: neck reaming die with reamer; No. 1 and No. 2 form dies; No 3 form and trim die; full-length sizer die; and bullet seating die. All dies are RCBS. Although I had known of the 17 caliber since 1958, following the introduction of P.O. Ackleys Handbook for Shooters & Reloaders, it wasnt until 1961 that one was in my gun rack. At the time my family and I were living at Lake Tahoe, California, and there was a sporting goods store located nearby called The Outdoorsman. I did some gun work for their gun department, such as minor repairs, mounting scopes, stock work and checkering, and recoil pads. The man behind the counter and I were about the same age and had become friends over time. One day I was picking up some work and he said he had started a project he couldnt finish and asked if I would be interested in it for $60. This was a lot of money to a young family man in those days. I was able to work out the cost with my labor charge. My box of goodies included a small BSA Martini Cadet single-shot action, barreled in 17 Ackley Bee by Ackley himself using an experimental eight-groove barrel in a medium heavy contour, 1:10" twist. Also included was a semishaped Fajen Aristocrat two-piece stock in a very nice piece of American black walnut. In a few weeks I had myself a very respectable single-shot varmint rifle, that up until then I had only read and dreamed about. Somewhere along the line I also had procured an excellent Litschert 8x target scope. Loading for my first 17 caliber rifle was very simple, as per P.O. Ackley: fill the case with DuPont 4198, scrape off excess at the case mouth, and seat a bullet which will create a compressed load giving a velocity of 3,550 fps to a 20- or 25-grain projectile. The choice of 17-caliber bullets available during the 1960s was very limited, to say the least. R.B. Sisk, Iowa Park, Texas, was well-known for his 22-caliber bullets during this period. He began making 17-caliber bullets in 20-, 25-, and 30-grain weights as the demand grew. These bullets looked as good as any on the market at the time but, in my humble opinion, they did not shoot worth a hoot. This accuracy problem was because of nonconcentric jackets, which has been the bane of many 17 caliber shooters over the years. Other bullet makers of note in those early years were Ted Smith of S.A.S., Lee Baker from Southern California, and some of the best the author has ever used, those from the Walker Machine Tool Co., Louisville, Kentucky. 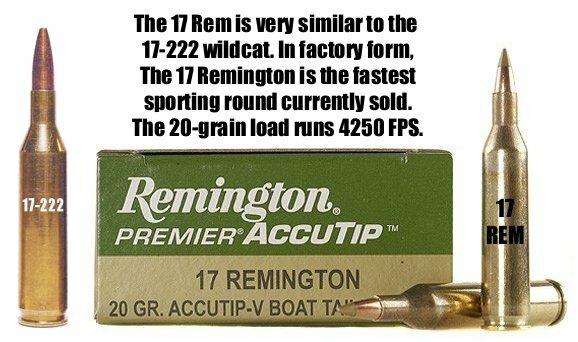 It wasnt until the debut of the 17 Remington in 1971 that we of the subcalibers were offered a suitable projectile. Those purveyors of note were Hornady, Walt Berger, Fred Woods, and others who used J4 jackets and superb bullet-making dies from experts in this field. Remington Arms also offered an excellent projectile to the shooters of that time period. Ed Shilen of Ennis, Texas, not only made 17-caliber bullets but some of the finest stainless steel match barrels and triggers the author has used over a period of forty years. Bullets, barrels, and bedding (the three Bs) and triggers constitute the formula for a superbly accurate varmint rifle, or whatever type rifle that readers may shoot. In the late 1950s and early 60s there were only a few barrel makers with tooling to make tubes as small as 0.168" by 0.172" lands and grooves. Those of note were the godfather of wildcatting, Parker O. Ackley, Salt Lake City, Utah, and A&M Gunshop, Prescott, Arizona. Both of these barrel makers used the cut rifling method, one groove at a time. Ackley was known to have discarded four out of five barrels for various reasons during manufacture. This same scenario also was taking place in the A&M shop, and Bill Atkinson (now the shop foreman for the Ruger pistol plant in Prescott) told me in 1977 that they actually made only a few 17 caliber barrels, finally giving it up because of the attrition rate. 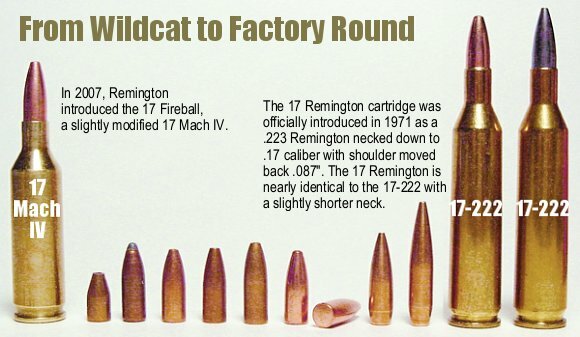 Even Remington Arms made poor 17 caliber barrels in the early 1970s when they introduced the 17 Remington cartridge. It wasnt until G.R. Douglas and Co. designed the button rifling method that things got much better for 17 shooters. In 1971 Remington changed the entire 17 caliber world by offering factory [17 Rem] rifles, ammunition, brass, and bullets to those shooters who were so inclined. [Editor's Note: In 1971 Remington introduced the factory 17 Remington cartridge. Officially a .223 Remington necked down to 17 caliber, it was, in fact, much closer to the 17-222 wildcat in dimensions and case capacity.] Things finally began to look promising for the future of one of the most controversial calibers in firearms history, but it took another thirty-two years before the general shooting public accepted the 17 as a legitimate varmint buster and not just a whimsical pellet gun shooting jacketed hollow-point bullets. Of course, Im referring to the interval between the 17 Remington and the 17 Hornady Magnum Rimfire (HMR). It seems as though handloading is becoming pass?. propellants we have today, Im sure many of these loads could be improved upon, as many of the 17 caliber wildcats are more than fifty years old. Almost fifty years ago the guru of modern wildcatting, P.O. Ackley, commented in his Handbook for Shooters & Reloaders that, A cartridge containing more than 25 grains of powder was impractical for a 17-caliber wildcat. 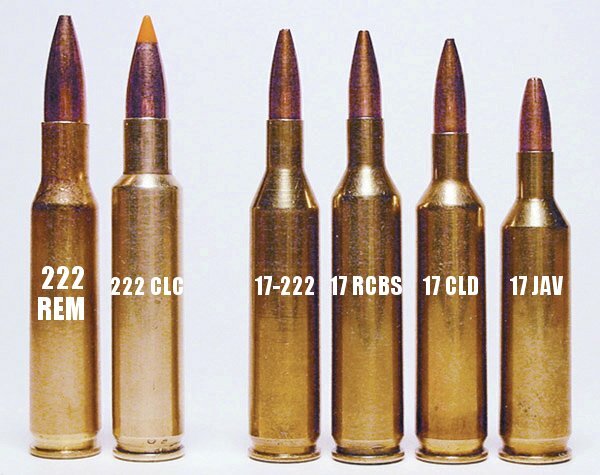 The 222 family of cartridges is probably the most popular case in use today for the 17 caliber wildcats. The introduction of the 222 Remington in 1950 resulted in the development of many other excellent cartridges based on the 0.375-0.378" size case head. 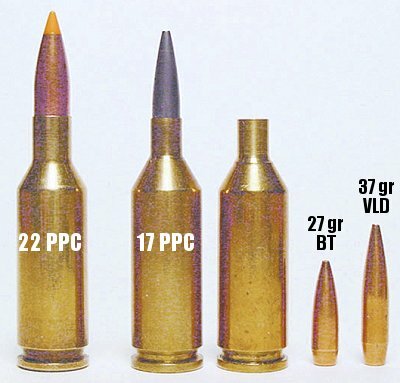 The 222 Remington Magnum, the 223 Remington, the 221 Remington Fireball in 1962, and more recently, the RWS 5.6x50mm Magnum. Without a doubt, this case head size has been the basis for more 17 caliber wildcats than any other in use today. The 17 Mach IV was designed by Vern OBrien, Las Vegas, Nevada, in 1962. It simply is the 221 Remington Fireball necked down to 17 caliber, using a 30-degree shoulder. In 2007, Remington Arms introduced a new rifle cartridge based on their 221 Fireball necked down to 17 caliber. Aptly named the 17 Remington Fireball, it is their version of our most popular 17 caliber wildcat with minor changes from the original design in some areas. [Editor's Note: So far, the new standardized 17 Rem Fireball appears to be a big hit. Loaded ammo as well as 17 Fireball brass has sold extremely well and is in short supply. 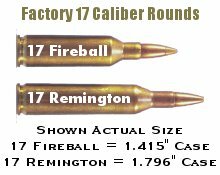 The 17 Fireball is outselling the 17 Rem by a huge margin.] Some shooters who load for the 17 Mach IV are claiming 4,000 fps and over with a 25-grain bullet. I am a little skeptical about these results but I guess it brings on a lot of oohs and aahs. Some of our popular powders have been around since the late 1920s and the early 1930s. Most of these powders have long granules and can be difficult to load into the small 17-caliber case neck. With the advent of ball powder and H322, this becomes less of a problem and also may produce better ballistics. style stock. This rifle was the first of many that I made up in the 1960s and 1970s. was 18.6 grains of 3031, which launched the 25-grain Sisk bullet at 3,850 fps. Since the 1960s, ball powders and small-grain extruded powders, like H322, have changed the world of the subcalibers dramatically. With the introduction of the so-called high energy propellants, loading for the 17 caliber becomes more interesting. When I started competitive benchrest shooting in 1975, the powder of choice was H322 in the PPC cases, and also in my 6x47 with 68-grain Remington match bullets. Since those days, H322 and variations have been my choice for a number of varmint cartridges I load, including the 222 Remington, 223 Remington, 22 and 6mm PPC, 17 Ackley Bee, and 17 Javelina. Since it was introduced to the world in 1950, the 222 Remington has been one of the most popular varmint cartridges on our planet. It also became the basis for many 17 caliber wildcats  short, medium, and long. The standard 17-222 is relatively easy to make by necking down the case with no other change. Variations usually are just a change in shoulder angle and body taper, to whatever suits the designers fancy. They all use a similar powder charge, within a few grains, and therefore exhibit the same ballistics within a few percent. These loads are maximum per Hodgdon Data Manual No. 25. Some improved designs of the 17-222 might be able to use a grain or so more of a medium burning powder. One intrinsic problem with any 17 caliber cartridge is that the slightest increase in the powder charge will raise pressures dramatically, and forget the old axiom of half-grain increments when working up a load. The late editor of Rifle and Handloader magazines, Dave Wolfe, has been credited with this one, although I believe there were others using the same idea at the same time. 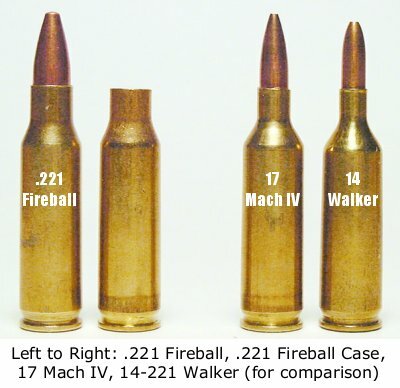 The rules of expansion ratio dictates how much and what types of powder can be efficiently burned in a 0.172" diameter bore, regardless of what length barrel is used. The 17-222 Magnum is about optimum for this caliber and will produce some nice gains in velocity. This was another 17 wildcat that was popular in the 1960s, as it was easy to form and produced good ballistics. For those enamored with using surplus military brass, this is the one for you. Most of those who have worked with this design push the shoulder back to create a longer neck length and sharper shoulder angle. One example has a 30-degree shoulder. This is a relatively new design sent to me by Bob Simonson of Kalamazoo, Michigan. He's a noted carbide bullet die maker, specializing in the VLD designs of William B. Davis Jr., known for his expertise in this field. No known loads were available as of this writing. I have a sample case with a 37-grain, moly-coated, boat-tail, VLD bullet. Several years ago I was writing for another specialty gun magazine. Before leaving the staff I had announced that I was going to write a book on wildcat cartridges, a subject that had not been updated for several years. I also had asked the readership to submit any new ideas they might have, along with a sample case. One interesting wildcat was sent to me by Paul Zollinger of Sterling, Ohio. Paul's 17x50mm Improved is based on the 5.6x50 RWS case. Mr. Zollinger shot several half-inch groups at 100 yards at these velocities. introduced the 7 1/2 small rifle primer. Since then, this primer has been the top choice for all my handloads requiring a small rifle primer, except for my bench rest guns. In these I use the Federal 205, the choice of most competitors. does not always apply to accuracy handloads, but with ball powder this saying probably will apply, within reasonable parameters. Some rumors have been floating around that the new 20 calibers eventually will supersede the 17 caliber, but I believe there is enough interest in these calibers that both will be around for years to come. And what if there were a legitimate 14 caliber to run with the big dogs? What More Info on 17s? The 17 Remington, in GunsandAmmoMag.com. Which 17 Caliber, in Saubier.com. 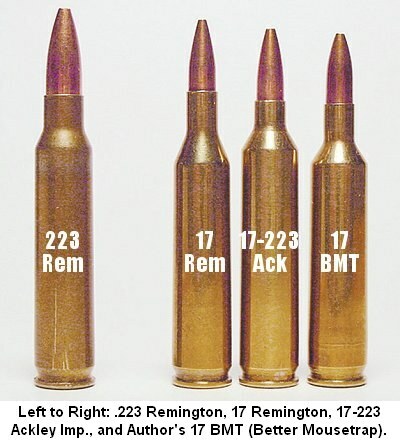 17 Mach IV vs. the 17 Remington, in RifleMagazine.com. .17 Remington Fireball, in HuntingMag.com. 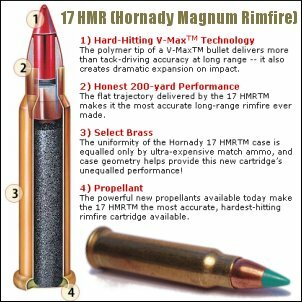 Hornady's Sweet Seventeen HMR, in ShootingTimes.com. 'Sweet Heat' -- the 17 Fireball, in GunsandHunting.com. Wolfe Publishing  Handloader magazine, No. 3. 24.5 grains of 4320, 25-grain bullet, 3,900 fps. (A Classic Load). Editor's Note: Author Cundiff originally listed these older calibers first (organizing his article chronologically.) However, since they are no longer commonly used, we've moved their descriptions to the end of the article. Cundiff notes: "The following is for historical purposes only and loads shown are only for comparison". available, but it is known that DuPont #80, a very quick burning propellant of that era, was used with cast and jacketed bullets of various weights. The centerfire cases were made from large brass wood screws. I can remember reading a want ad in the American Rifleman years ago from the man in King of Prussia, Pennsylvania, and there is no treatise on the subcaliber wildcats that would be complete without his mention. His cartridges were based on the 22 long rifle case, including 10 caliber, 12 caliber, 14 caliber, 17 caliber, and 20 caliber. For more information on these and other Eichelberger cartridges, please refer to Cartridges of The World, 11th Edition. This was the first (1945) of many 17-caliber wildcats to come from the house of Ackley. This case was chosen because he had made up a small bolt action which was exactly right for the Carbine cartridge. Loading is similar to the 17 Ackley Bee. Landis was a noted Canadian writer during the 1950s. He wrote several books on rifles and varmint hunting. Two of his most famous works are Twenty Two Caliber Varmint Rifles and Woodchucks and Woodchuck Rifles. The 17 Woodsman is based on the 25-20 Winchester single-shot case, which also is the parent for another famous 22 caliber wildcat, the 2-R Lovell, which was popular before the advent of the 222 Remington in 1950. Some impressive velocities are noted with the 17 Woodsman, but cases have not been available for many years. This was my first 17 caliber experience. P.O. Ackley replaced the 17 Peewee with the 17 Bee because of the lack of suitable actions for the Carbine case. It is a highly efficient little case and produces relatively high velocities for its capacity. I probably will get a scolding from my fellow senior citizens, 65 years or older, on this one ... but the 22 Hornet has never been a favorite of mine simply because of its very weak, antiquated case which has not been improved upon since the 1930s. Sorry guys. If youre a die-hard fan of the Hornet, the 17 Ackley version is your baby. Some loss of cases may occur during fireforming, but the 17 Hornet is a good one for single-shot rifle fans and exhibits decent ballistics for its size. TOPICS: VHA, Varmint Hunters Association, Richard Cundiff, 17 Caliber, Seventeen, .17, .17 Wildcat, Wildcat Cartridges, 17 Remington, .17 Remington, 17 Fireball, 17 Mach IV, .221 Fireball, 221 Remington Fireball, .222 Remington, .223 Rem, .223 Remington, 17 Javalina, 220 Russian, 17 PPC, 17-222, 17-223, 17 Ackley, 17 Jet, 17 Ackley Bee, Shilen, Varmint, Varminting, Reloading, RCBS, Case Forming.
? 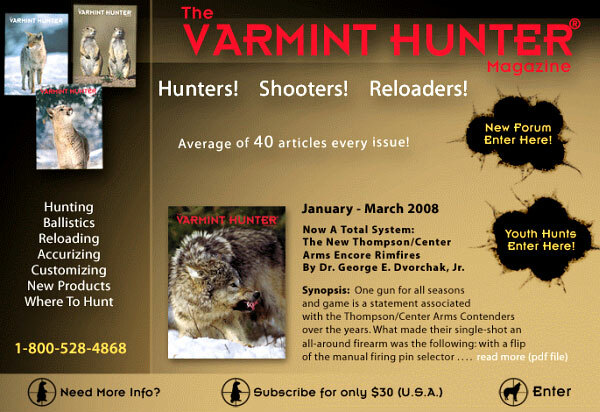 Copyright 2007, The Varmint Hunters Association, Inc., P.O. Box 759, Pierre, SD 57501, (605) 224-6665, All Rights Reserved. Additional material ? Copyright 2007, AccurateShooter.com, no reproduction without advanced permission in writing.